Recently, while strolling through New York’s Central Park with Totally TKD magazine’s esteemed editor, his daughter, and frequent contributor Master Vitale, I went on my usual rant concerning the loss of subtlety in the arts these days. it occurred to me that I never really fully explained what I meant. so picking up from my first attempt at discussing this (TTKD # 51) I will attempt to return to the matter with greater clarity. In my previous discussion we concerned ourselves with the small details that assisted in making our movements and stances more effective. Since the title did mention the wrist, I feel, in the interest of truth in advertising, we should start our present discussion with a look at how a tiny change in wrist position can alter a technique dramatically. As our base example let’s start with “making” a proper fist. the first issue for most beginners is alignment. this is actually quite easy. have the student point at something in the distance. Then all they have to do is fold the index finger back and they will have a properly aligned fist. Now let’s dive deeper. most people when forming the fist will fold the thumb over both the index and middle finger. 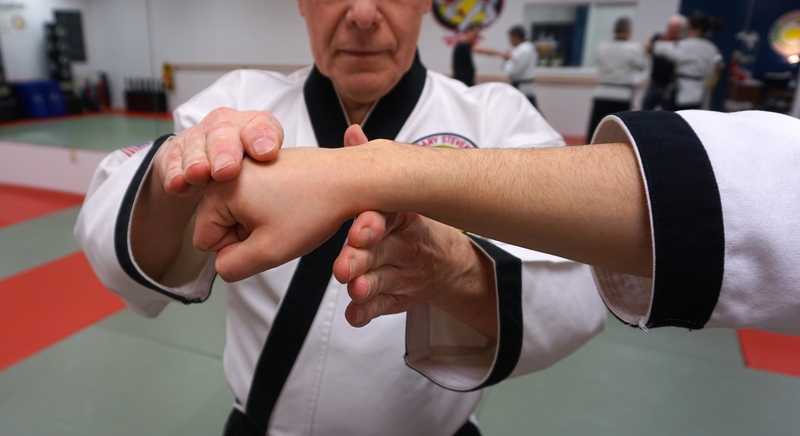 this reduces the integrity of the wrist and fist. Make a fist with the thumb over both fingers. Have a partner place one hand at the base of your wrist and the other on the top of your fist. 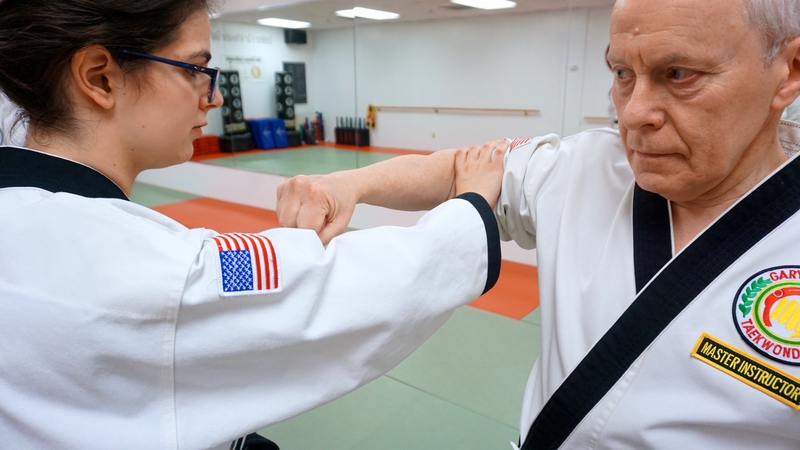 His job is to bend your wrist–yours is to keep it straight. 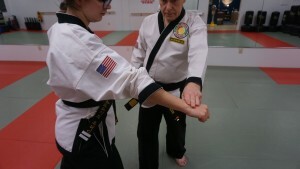 Most of the time, unless your wrist is very strong, your partner will succeed in bending it. Note the amount of effort you need to use to maintain your position. Now do the same things but this time only allow the thumb to cover the index finger. Repeat the test as above. Suddenly your partner has to really sweat to get anywhere. Most of the time they will not succeed in getting your wrist to bend. You will feel that there is almost no effort on your part. All of that from just a slight repositioning of the thumb! 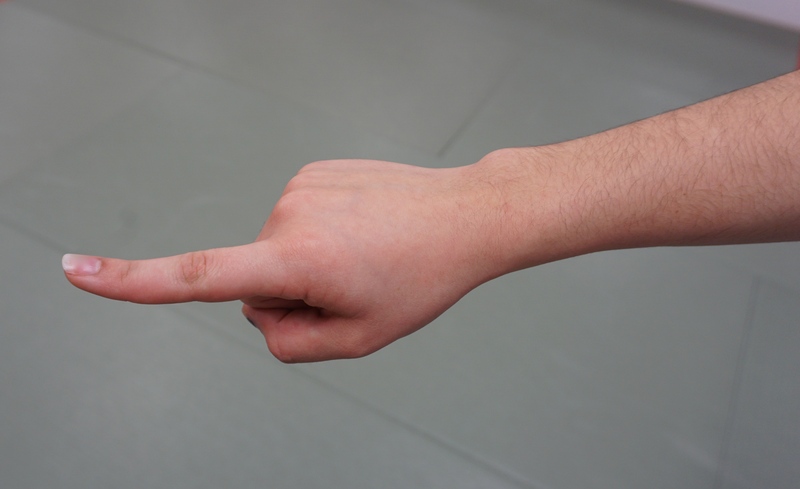 The position of the thumb can actually have system wide effects-in essence changing the relative strength and energy of the entire body. That discussion however is beyond the scope of this article. I have mentioned this in other contexts but I here am remaining with basic punches. 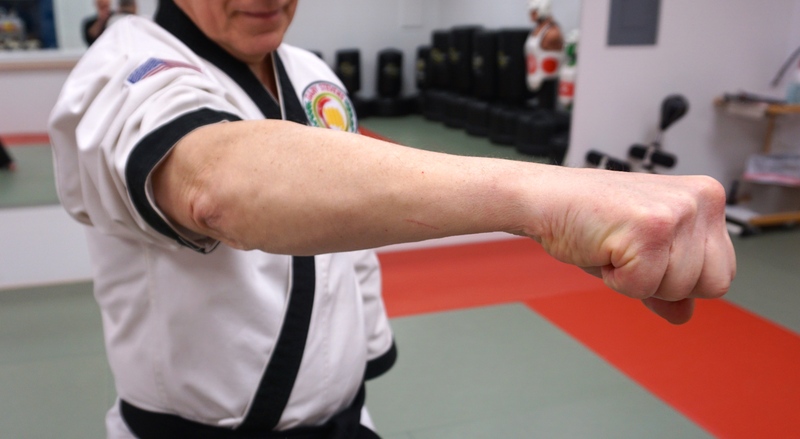 Most TKD people punch with a fully pronated (horizontal) fist. Without being careful this leads to some problems, the primary one being the position of the elbow. For maximum effect the elbow must always point downward! 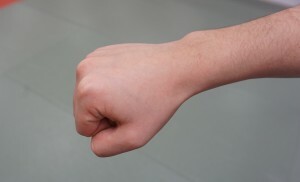 Make a fist and hold your arm out to the side at shoulder level. Have your partner put their hand on your upper arm just above the elbow. Your job is to push him moving your arm forward. Again, you will find it takes a fair amount of effort, and may not succeed in moving him at all. 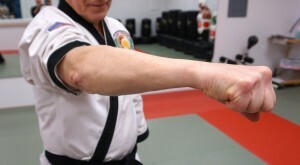 This time, keeping the same bend, place your arm at your side, so that the elbow faces down. Your partner places his hand as before. Now push forward as if you were executing a punch. Note how much stronger you are! You may actually be able to move your partner. You get to decide which you prefer, elbow out or elbow down. We tend not to pay much attention to the position of our feet when executing our techniques, but once again the position of our foot can have a systemic effect throughout the body. 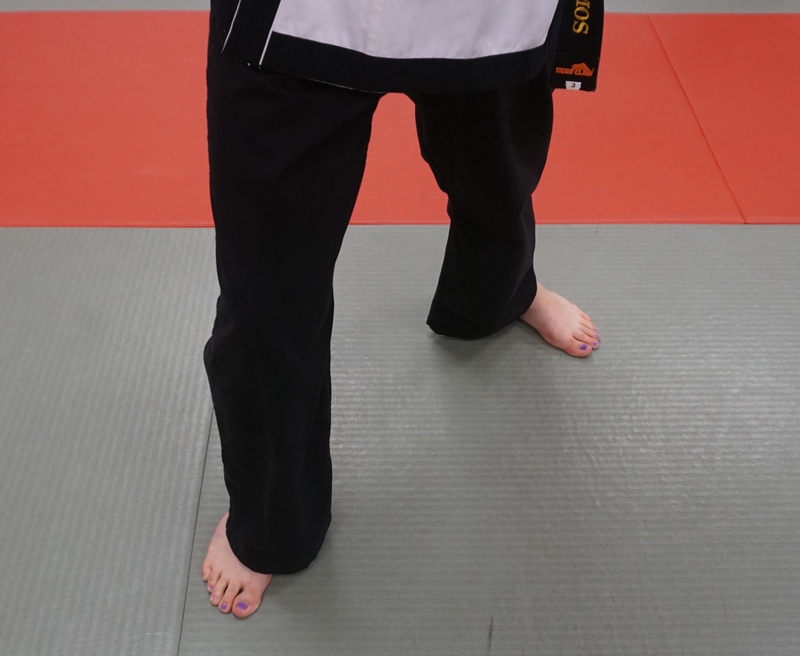 Stand in a forward stance with your arm in front of you as if you have just executed a forward punch. Take care to position both feet facing forward. 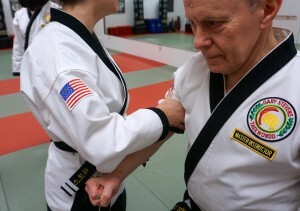 Have your partner place his hand on the top of your wrist and push down as you resist. Note how much effort is required by you to do this. Keeping everything the same, rotate your rear foot to the outside. Have your partner retest by pushing down. Did your arm collapse? Did it feel as if the available muscle power just left for a lunch break? Think about how common this foot position is among TKD practitioners. You see it almost everywhere. Now think about the effect it is having on them. I suppose that this is a byproduct of our fast moving lives, where information is blasted at us at a frenetic rate, but much of value is lost in this manner. We teach our techniques and forms to a large group, and do our best to make sure they get it right, and, to a large extent they do. For many though, the tiny details that make things work don’t get through. In the end, what looks right becomes what is right. The rest is covered up by muscular strength, momentum, flashy stuff, or often, just ignored. 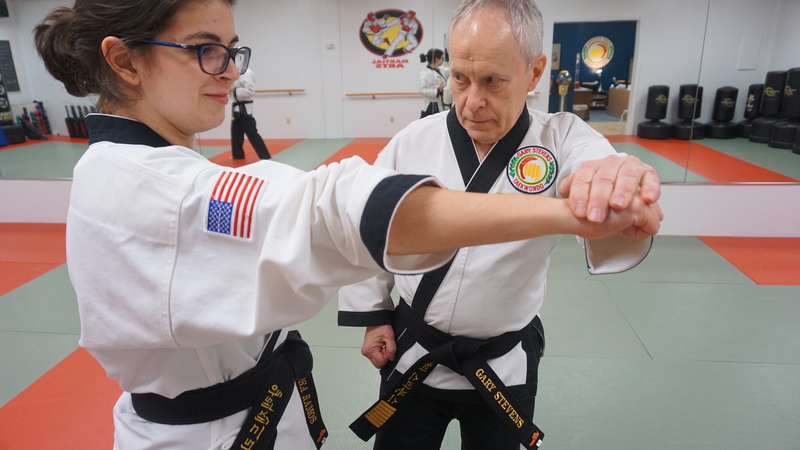 Richard Conceicao would like to thank Master Gary Stevens and A. Ramos of Gary Stevens TKD, Glenn Rock, New Jersey for their assistance in these photos. He is als o available to demonstrate this sort of weird stuff in person to non believers as it happens all the time. Nice article! Enjoyed it very much! One point I would like to make is that the elbow when in lower position rather than high is closer to the “center” of the body, the center of mass, which always makes the limb stronger. I teach this with wrist releases. The elbow must be close to the center to have the most strength possible. This maxim — that the closer to your center your limbs are, the stronger you are, can be demonstrated quite easily by making a fist and holding it out in front of you like a punch. Ask someone to move your fist. They can do so quite easily. Now draw your hand closer to your body, in front of your chest or solar plexus. Ask the same person to move your fist again. They will not be able to move your fist as easily or as much. I will have to check the thumb position and the forward facing foot in long walking stance. I have not heard these before per se, but I know that the foot turned way out in the back misaligns the hips and strips power. Have not tested the forward facing vs. 30 degree angle though. Thanks for the food for thought! thank you! we used to call that the “power zone” i teach it for most techniques as well. similar test too! Can i call you a “great mind” if you agree with me? 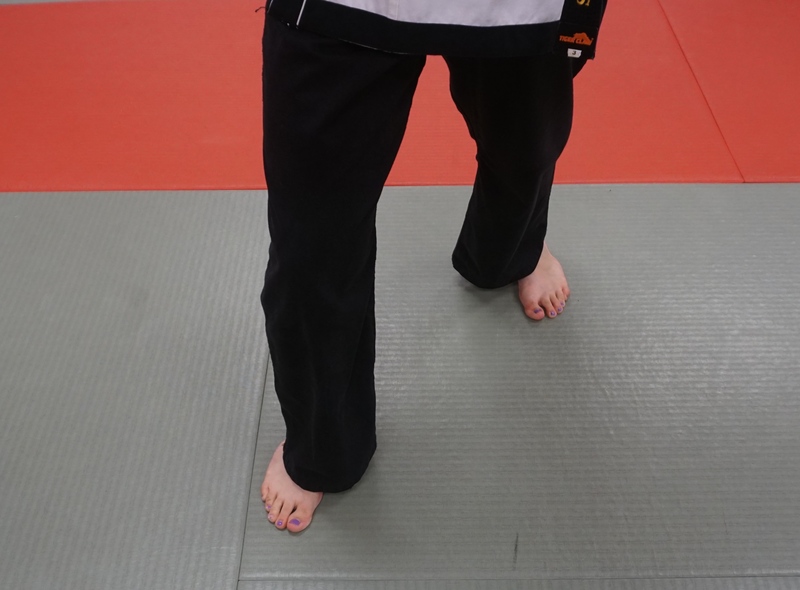 once the principle is explained, i then ask practitioners to think about how they can move their opponent out of their power zone and into yours.